This is adapted from an old Pampered Chef recipe that I use to make all the time. The original recipe is a large rectangular shaped calzone made in a 9x13 pan. I made this "fancy" by making it look like a really huge traditional calzone. I haven't made this in years and I had forgotten how good this is. We both loved the herbed crust and the creamy filling. This was a nice change to our usual pizza night. I am going to have to add this back into the rotation. Mix together all cheeses, Italian seasoning and egg white. Roll out pizza dough into a large circle on parchment paper. Spread the cheese mixture over half of the pizza dough to within one inch of edge. Sprinkle cheese with your meat and/or veggies. Fold the opposite side of the dough over the filling and pinch edges to seal. Bake for 25 minutes. Allow to cool and serve with pizza sauce. *I brushed the calzone with some olive oil and Italian Seasoning during the last 5 minutes of baking. 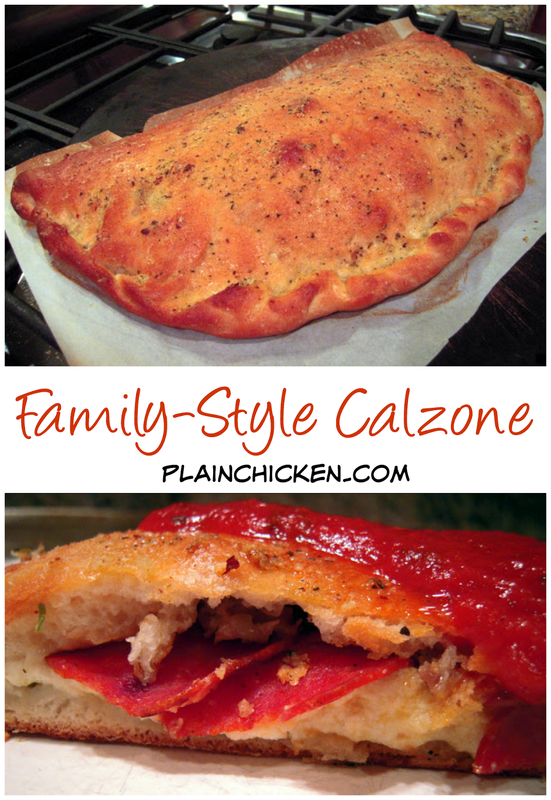 I have seen quite a few blogger friends are on the roll for calzones! I guess I should join in the fun too! Looks yummy! As you know, I don't do dough, but I've been dying to make a calzone. We have a little Italian place about an hour away that makes the best. I want to try to imitate some of their fillings since it's not convenient to visit. Thanks for this recipe Stephanie. Put the sauce inside and this becomes a panzarotti! YUM!! Just found your blog thanks to the link on al.com. Can't wait to try some of your recipes! I need to make this instead of ordering next time. The pizza we got was horrible and this looks delicious. I'll be taking some tips from this. We tried making our first calzone this week and while it was good, wasn't great. I think the seasoned crust would have been the difference. Ok, let's try this again. Last time it said service unavailable! Looks terrific...I'm gonna have to hunt down a pizzeria for lunch today! yum - easy and filling and pretty! LOVE your blog! So glad to find someone who cooks real food! As a working mom I love all of your "make-ahead" tips too. Had this calzone last week and it was wonderful! Can't wait to experiment with different fillings. I've made this several times now and really like it. What kind of dough do you use?